A Very Rare Setup: Who Will Win The Tug Of War In The Oil Market? There has been a tug of war in the oil price over the past two weeks. 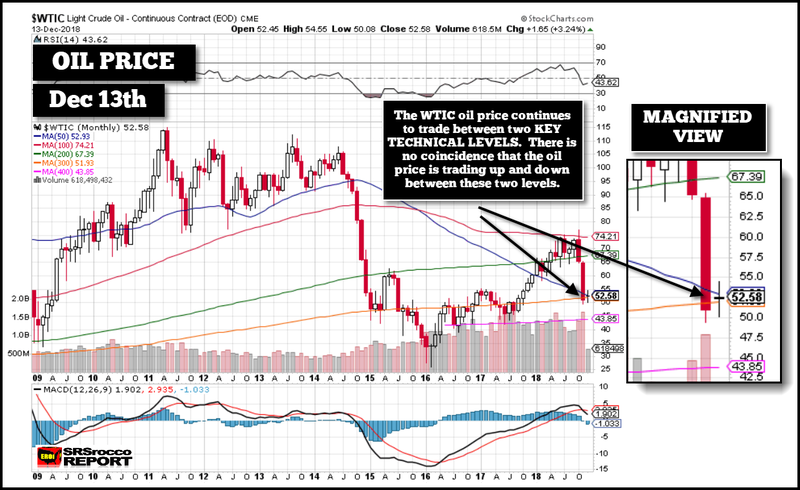 Due to a very rare setup in the market, the oil price has traded in a very narrow range as traders fight it out to see who will win control… the BULLS or the BEARS. My bet is on the bet is on the bears. 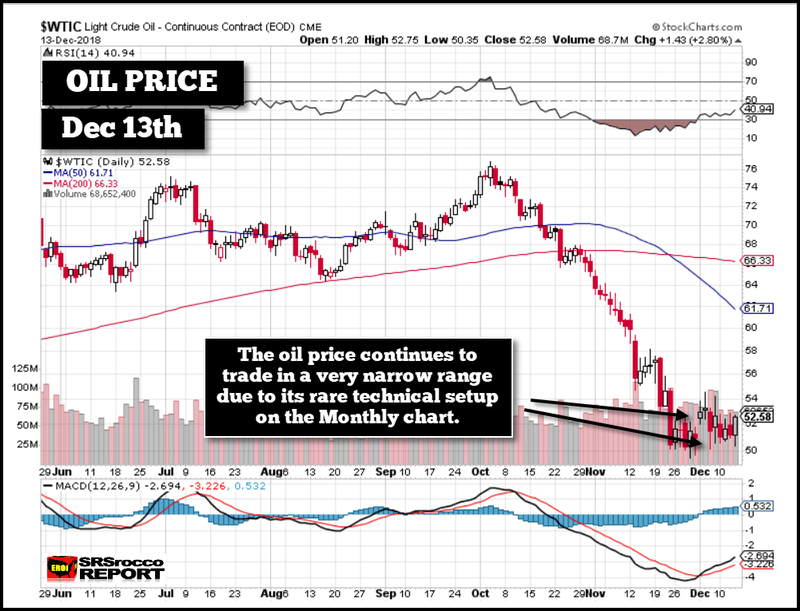 Amazingly, the oil price is literally stuck right between two critical technical levels. If you look at the magnified view, you will see that the oil price that closed today at $52.58 remains between these two moving averages. The large red candlestick shows the decline in the oil price in November as each candlestick represents one month of trading. So, the current candlestick that looks like a Cross (called dogi) is for the first two weeks of trading in December. Thus, the reason the oil price in the first daily chart above hasn’t moved from the narrow range can be found by looking at the monthly chart. My goal is to reach 500 PATRON SUPPORTERS. Currently, the SRSrocco Report has 186 Patrons now! I would also like to thank those foundation supporters, who have chosen to become a member by making donations through PayPal to further the research and publishing work at the SRSrocco Report. So please consider supporting my work on Patron. Or you can go to my new Membership page. If you are new to the SRSrocco Report, please consider subscribing to my: SRSrocco Report Youtube Channel. If you would like to support the SRSrocco Report site, please check out the information. Independent researcher Steve St. Angelo (SRSrocco) started to invest in precious metals in 2002. Later on in 2008, he began researching areas of the gold and silver market that, curiously, the majority of the precious metal analyst community have left unexplored. These areas include how energy and the falling EROI – Energy Returned On Invested – stand to impact the mining industry, precious metals, paper assets, and the overall economy. Steve considers studying the impacts of EROI one of the most important aspects of his energy research. For the past several years, he has written scholarly articles in some of the top precious metals and financial websites.